Eastern Orthodox Christian theologian, philosopher, historian, and cultural commentator. BRIGID (BRIDGET, BRIDE), the “Mary of Ireland”; our venerable Mother Brigid of Kildare, or Brigid of Ireland (Bridget, Bride; Gaelic: Naomh Bhríd), was an Irish nun, abbess, and founder of several convents. Along with St. Patrick of Ireland (17th March) and St. Columba of Iona (9th June), she is one of the three patron saints of Ireland. According to tradition, St. Brigid was born at Faughart near Dundalk, Co. Louth, Ireland to Dubhthach, a pagan chieftain of Leinster, and Brocca, a Christian Pictish slave who had been baptized by St. Patrick. Known for her compassion for the poor even as a youth — giving away her family’s food and even valuable possessions to those in need — and despite family objections, she was drawn to the monastic life. After her family saw there was no possibility to convince her to pursue a life in the world, a young St. Brigid received monastic tonsure at the hands of St. Mel of Ardagh (6th February). Soon after, she established a monastery on land called Cill Dara (Kildare), or “the church of the oak” which had been given to her by the King of Leinster, thus founding women’s coenobitic monasticism in Ireland. Under St. Brigid’s leadership this monastery grew to become one of the most prestigious in Ireland, and famous throughout Christian Europe. Renowned for her common-sense and most of all for her holiness, even in her lifetime she was regarded as a saint. St. Brigid reposed circa 525 and was buried in a tomb before the high altar of her monastery. During the Danish invasions, her relics were translated to Downpatrick where they were buried with those of St. Patrick of Ireland and St. Columba of Iona. Late in the thirteenth century, her head was extracted and brought to Portugal by three Irish knights on their way to fight in the Holy Land. They left this holy relic in the parish church of Lumiar in northern Lisbon. Portions of the relic were brought back to Ireland in 1929 and placed in a new church of St. Brigid in Dublin. and flew on the wings of your longing for God. you kept your promise to remember those who have recourse to you. You shower grace upon the world and multiply miracles. Intercede with Christ our God that He may save our souls. and with the grace of God attained in this way the summit of virtue. She now bestows blessings upon those who come to her with faith. that He may have mercy on our souls. BRIGID, (Ninth Century), the sister of St. Andrew, (22nd August), Abbot of St. Donatus in Fiesole in Tuscany. According to tradition she was carried to her brother's deathbed by angels. Following St. Andrew's repose, St. Brigid lived as an anchoress in the Apennines, where she reposed of natural causes. CINNIA, St. Cinna was a princess of the Kingdom of Ulster, who was baptised and then tonsured a nun by St. Patrick (17th March). She then entered a monastery where she was a disciple of the Abbess, Cathuberis. St. Cinnia was responsible for bringing many of her compatriots to Christ and was a renowned wonderworker. St. Cinna reposed towards the end of the fifth century. CLARUS, a hermit in Seligenstadt, in the present-day state of Hesse in Germany. St. Clarus reposed circa 1048, no further information is extant. CREWENNA, a companion of St. Breaca (4th June) on her trip from Ireland to Cornwall. The only record extant of this saint's existence is the place-name Crowan, near Erth. DARLUGDACH (DARDULACHA, DERLUGDACH), St. Darlugdach was St. Brigid’s (vide supra) favourite pupil and her successor as Abbess of Kildare. St. Ultan (4th September), in his Life of St. Brigit, writes that at one-point Darlugdach had fallen in love, and one evening when she was to have met her lover she left the bed in which she and St. Brigid were sleeping. Knowing the perilousness of what she was about to do, she prayed to God for guidance, placed burning embers in her shoes and then put them on. ‘Thus, by fire she put out fire, and by pain extinguished pain.’ She then returned to bed. St. Brigid, though apparently asleep, knew all, but said nothing. The next day Darlugdach told St. Brigid everything, who then told her she was now safe from the fire of passion here and the fire of hell hereafter; and then St. Brigid healed St. Darlugdach’s feet. There is a tradition that St. Brigid told her she would die on the first anniversary of her own repose. St. Darlugdach did in fact repose on the anniversary of St. Brigid’s repose circa 524. JARLATH (HIERLATH), a disciple of St. Patrick (17th March) and successor of St. Benignus (9th November) to the See of Armagh. Little more is known of him. It appears that St. Jarlath reposed circa 480. KINNIA, (Fifth Century), St. Kinna was a holy maiden baptised by St. Patrick (17th March). St. Kinnia's cultus is particularly strong in Co. Louth. PAUL of TROIS-CHÂTEAUX, a hermit near Arles, who was later chosen Bishop of what is known today as Saint-Paul-Trois-Châteaux, in south-eastern France. St. Paul reposed circa 405. SEIRIOL, son of Owain Danwyn ab Einion Yrth ap Cunedda Wledig, King of Gwenydd, the spiritual father of St. Elaeth the King (10th November), and founding Abbot of what became Penmon Priory on the Isle of Anglesey in Wales. It has been said that he and St. Cybi (8th November) were good friends, and would meet weekly near Llanerchymedd, at the Clorach wells. St. Seiriol flourished during the first half of the sixth century, spending his final years as a hermit on the island which is now called Ynys-Seiriol (Puffin Island), off the coast of Anglesey Wales, where the remains of his hermitage still exist. SEVERUS of RAVENNA, a native of Ravenna, who was consecrated bishop of that city in 283, attended the Council of Sardica in 344, and reposed circa 348. In 836 his relics were translated to Erfurt, Germany. SEVERUS of AVRANCHES, a monk, then abbot, then Consecrated Bishop of Avranches. In his later years, St. Severus returned to monastic life. He reposed circa 690. His relics are enshrined at Rouen, France. SIGEBERT, St. Sigebert III was King of Austrasia (r. 633–656). A spiritual child of St. Cunibert of Cologne (12th November) and father of King St. Dagobert II (23rd December) (r. 676–679), St. Sigibert lived a pious, but brief life, reposing in 656 at the age of twenty-five. He is remembered for his charitable works, founding numerous hospitals, churches, and monasteries, especially the Abbeys of Stavelot and Malmédy in Flanders. URSUS, (Sixth Century), an Irishman who evangelised the area around present-day Digne-les-Bains France and defended the Church against the Arian heresy. St. Ursus settled just across the French-Italian border in Aosta, where he served as an Archdeacon under Jucundus, Bishop of Aosta. After St. Ursus' repose, his relics were enshrined at the collegiate church of Saint Peter and Saint Ursus in Aosta. Prior to the Schism the Patriarchate of Rome was Orthodox, and fully in communion with the Orthodox Church. As Saint John of Shanghai and San Francisco +1966 said “The West was Orthodox for a thousand years, and her venerable Liturgy is far older than any of her heresies”. Details of British Saints excerpted from Orthodox Saints of the British Isles. 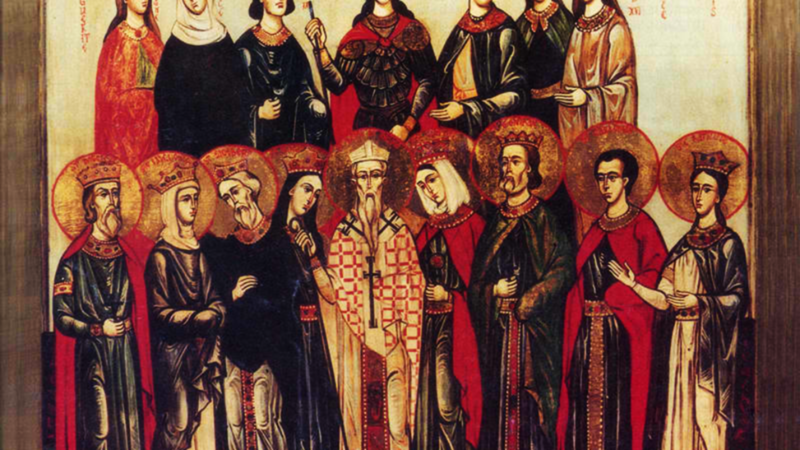 Details of continental saints from these sources. All opinions expressed on this site are my own. Unless otherwise noted they have no authoritative, canonical, or dogmatic weight.